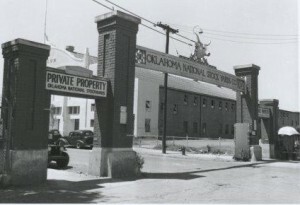 At the invitation of city fathers, with both their blessing and financial assistance, Oklahoma City became the site of the state’s first major industry – The Oklahoma National Stock Yards Company. The year was 1910, a scant three years after statehood, when the Edward Morris Company established a packing plant and livestock sales terminal on 120 acres two miles west of blossoming downtown Oklahoma City, providing 2,400 new jobs in a city of 60,000. 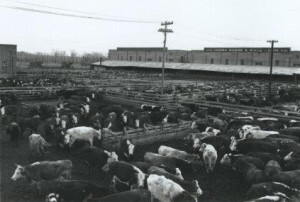 Until 1961, livestock sales were handled only by private agreement or treaty between the seller and buyer through the services of the on-premises commission companies. Then a second mode of trade was introduced, the auction, providing even greater competition for available livestock. 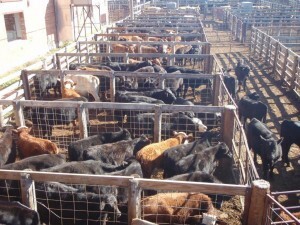 The auction helped supply a new spurt of growth, and combined with the aggressive sales leadership of the commission firms, innovative market management and strategic location, the Oklahoma City livestock market rose to become the World’s Largest Market of Stocker and Feeder Cattle selling yearly receipts of well over a half a million head. Stockyards City was founded October 3, 1910, and was built to serve the nation as a primary source for meat processing and packing. By 1915, Morris, Wilson and Armour all established huge packing facilities to slaughter the cattle, hogs and sheep which were transported first by cattle drive and later by railroad and truck. The area’s nickname for a time was “Packingtown.” By 1961, faced with complete overhaul and updating of equipment, the packing plants decided to close. However, the Stockyards still retains its profitable cattle trading and related businesses. Since its founding, Stockyards City has been the place for cattlemen, horsemen, farmers, ranchers and real cowboys to come for apparel, equipment, supplies, a good meal, and the opportunity to catch up on what was going on over a cold sarsaparilla with fellow cattlemen. For over 80 years, Stockyards City has continually offered the kind of quality products and services which are synonymous with the heritage of the West. Today, Stockyards City is part of the Main Street USA program. Area businesses are working hard to recapture the architectural flavor of the earlier part of this century, with gaslights and wooden storefronts. A number of special events have sprung up as well, including Longhorn Cattle Drive at the Christmas Parade each December, and sidewalk sales between Thanksgiving and Christmas. Stockyard City is the home of the largest stocker/feeder cattle market in the world. Since its inception, more than 102,000,000 head of livestock have passed through the iron gates leading to the Stockyards operation. Cattle auctions are held Monday and Tuesday each week. Many of the businesses in Stockyards City date back to the early 1900s when the area was home to the major meat packing companies. A good example is Langston’s Western Wear, established in 1916. Back then it was called “The Friendly Store,” and was one of Oklahoma’s best known general stores. Today, the merchandise is authentic western attire. Cattlemen’s Steakhouse was first opened in 1910 and was one of the few places that stayed open after sundown. During prohibition, a very colorful clientele was attracted to Cattlemen’s “Liquid Delights,” and really good steak. An historical highlight occurred in 1945 when Gene Wade, an area rancher, was challenged in a dice game by the owner of Cattlemen’s. He wagered his life savings against the restaurant. He threw a “hard six,” and found himself in the restaurant business. Although Mr. Wade is no longer with us, his pictures and mementos line the walls, and you can almost see his sitting there in his favorite rocker, chatting with the regulars. Other area stores also offer a wide selection of boots, belts, buckles, hats and accessories. And if you can’t find what you need off the shelf, there are highly skilled artisans ready to custom make whatever you need. Since the area was first settled, saddle making and repairing have been important factors at Stockyard City. Working cowboys depend on their gear, and this is where they come when their equipment needs work. Visitors can watch these skilled craftsmen at work creating prize saddles, belts, hats, boots and other accessories. There are all sorts of unique operations in the area. For example, Stockyards City is the headquarters for the International Professional Rodeo Association (IPRA), one of the two rodeo sanctioning bodies in America. The IPRA oversees more than 400 rodeo events each year. Stockyard City is a “must see” when visiting Oklahoma City. The store owners and community leaders have all worked very hard in keeping Stockyard City from becoming “touristy.” It’s a place where the cattle and horse people can get what they need, have a good meal and enjoy each other’s company. And, by golly, if a few greenhorns manage to wrangle their way into the boot shop, that’s okay, too. They won’t find any “My parents went to Stockyard City and all I got was this lousy T-shirt” shirts or Elvis salt and pepper shakers. But they may leave knowing what a real steak tastes like, and that real boots don’t come from Bloomingdale’s.